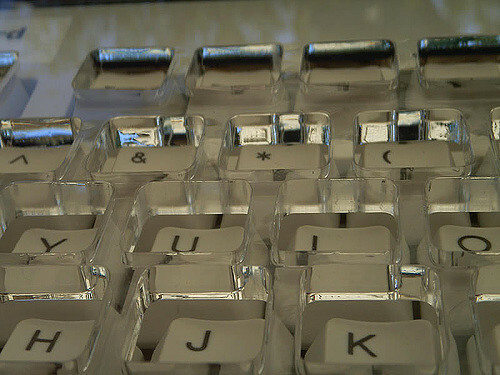 Detail of a keyboard with a key cover to stabilize fingers for the typer. Photo by Flickr user cobalt123. In disability studies, “cripping” is both an embraced and contested practice that describes the processes involved in resisting “compulsory able-bodiness” (McRuer 2006). To “crip” a concept or space involves a decentering of the able bodymind (Price 2011), the normative structures of time (Kafer 2013), and as we would like writers to explore, the normative experiences and uses of technology. We’re excited to host a blog carnival that seeks posts that participate in–or critique–a cripping of digital rhetoric and technology. Posts for this carnival can explore a wide variety of topics related to cripping digital rhetoric and writing. For scholars concerned with teaching multimodal writing, cripping brings tough but necessary questions to the focus on engaging the senses for both the writer and the audience. How can student writers–both disabled and not–create and write accessible multimodal projects? Writers invested in exploring the histories of digital technologies could trace how disability prompts technological evolution; for example, haptic writing technologies have a deep connection to writing technologies for people who are blind or have low vision. Scholars who question how technology mediates and policies the body could explore from an intersectional perspective how race, gender, sexuality, and disability all work together to put certain bodies at risk more than others for state violence. Interested in contributing to this blog carnival? Please send a short (100 word or less) proposal for your post to drcfellows@umich.edu. We will begin publishing posts in May, so please send your proposal no later than April 31st, 2016 by May 20th. Full blog posts will be due approximately two weeks after your 100 word proposal is accepted.